My kiddos are all about the Nerf Guns–there are so many Nerf guns the Nerf guns have Nerf guns. Well, now I have an example of why we don’t need any more Nerf guns–we can just MAKE THEM. Oh, I know. “Why didn’t you do that in the first place?” Two answers to that – 1) I’m super lame 2) I didn’t have a 3D printer, which doubles the amount of super lameness considerably. No mas, señor, NO MAS. Vedran Marjanović was in a similar spot. He bought a 3D printer last year, then another one five days later. Needless to say, he’s designing and printing like a madman now, and showing how to do it on his YouTube channel. 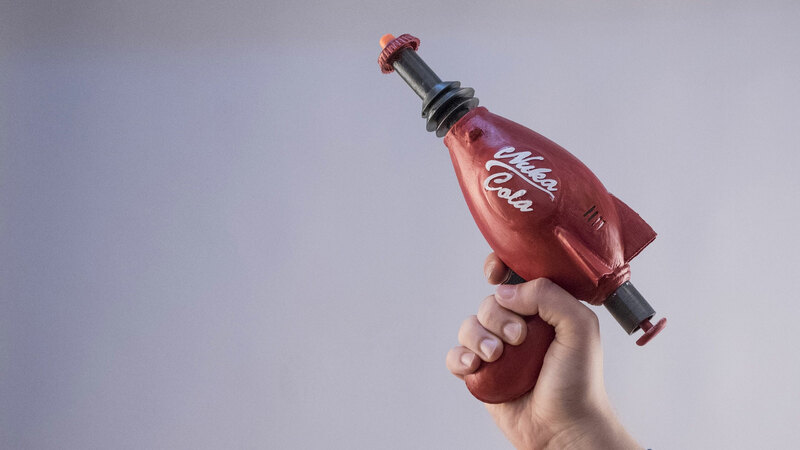 His latest is a 3D printed Nerf gun that looks just like the Nuka Cola Pistol from Fallout. How AWESOME is that?! Vedran used Fusion 360 to model the Nerf gun and a Creality CR-10 3D printer for the print. It does need rafts and support, although I think the model could be set up a little different to reduce/remove that need. He printed the parts at 0.1 – 0.3 mm with a 15-60%.